For sunrooms and other outdoor living structures, homeowners in Pace, Florida, turn to Majors Home Improvement. We are a local, family-owned company that has provided home improvement solutions since 1997, so you can trust that we have the experience, skills, and resources you need to ensure a top-notch renovation. 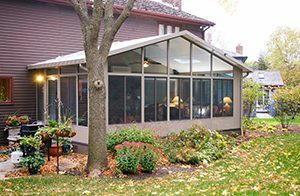 We install sunrooms from TEMO, one of the leading outdoor living manufacturers in the country, because we believe in providing our customers with the very best products on the market. At Majors Home Improvement, we pride ourselves on our installation process. Our installers are highly experienced and factory trained, so they can offer meticulous installations that are also efficient. This way, you’ll be able to start using your sunroom sooner than you ever expected. They also provide Red Carpet Service, which ensures you receive top-notch service from beginning to end. Contact Majors Home Improvement today to learn more about our sunrooms for homeowners in Pace, FL, and surrounding communities. When you do, feel free to inquire about our financing options for qualified homeowners.